The crowd applauded as Atlanta resident and Emory alum Lindsay Fetters, clad in a powder-blue suit dress, dashed into the ring with Eli, a graceful, spirited vizsla with a golden-brown coat. It was the recent Westminster Kennel Club’s best sporting dog competition. 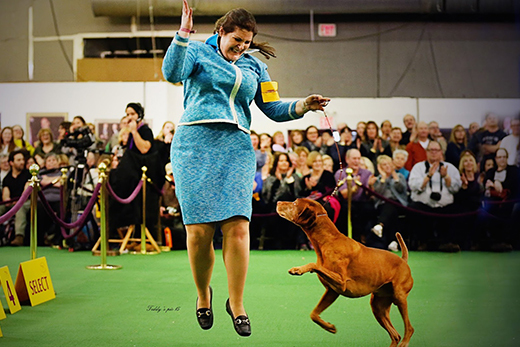 Fetters and Eli had just won a best-in-breed event at the show – making Eli the top vizsla in the country. Fresh from this victory, the pair seemed to glow as they glided across the green carpet. That’s right. While Eli did not take the prize for best sporting dog, he did get a nod for being the only Westminster show dog that assists with neuroscience research in his spare time. “After we won best in breed and moved on to the sporting event, I had to fill out a card for the announcer to say some unique things about Eli, so I put down the Dog Project,” says Fetters, who is the owner, breeder and handler of Eli. “The general public watches the show and I wanted people to know that these dogs are much more than just pretty faces. Many of these dogs do therapy work and other important things. “Also, I love Emory, so I wanted to plug it as much as I could,” adds Fetters, who received her MBA from Goizueta Business School in 2014.